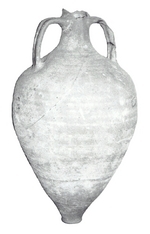 This is a small piriform-shaped amphora with a small flat base. It has a simple rounded rim, a cylindrical neck and long curved strap-handles with longitudinal grooves joined from just below the rim to the shoulder. See also the comparable Formlimpopoli and Spello types. Normally found in contexts of the third and fourth centuries AD, but possibly produced for local use in the Arno valley in the second century AD and still in use during the fifth century (Pasquinucci & Menchelli, 1995; Martin, 1999; Pasquinucci & Menchelli, 2002, Pasquinucci et alii 1998). Wasters have been found at Empoli (Manacorda, 1977; 1987; Pasquinucci & Menchelli, 1995; Pasquinucci & Menchelli, 2002, Pasquinucci et alli, 1998), although differences in fabric suggest other production centres in the Arno Valley (Martin, 1999). Predominantly Etruria, Rome and Ostia (Pasquinucci, and Menchelli, 1995; Pasquinucci et alii, 1998; Martin, 1999; Pasquinucci and Menchelli, 2002, Pasquinucci et alii, 1998). Etrurian wine is suggested (Pasquinucci et alii, 1998).